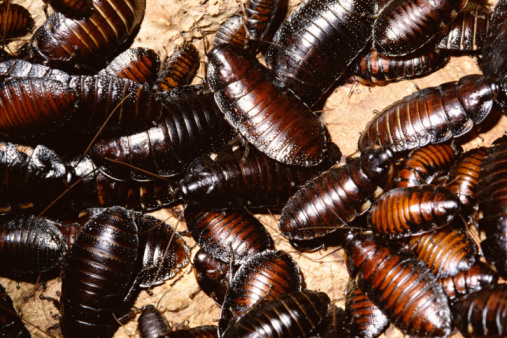 Your house should be a welcoming place for you and guests, unless those guests are of the creepy-crawly variety. Silverfish are soft-bodied, wingless insects that are shaped somewhat like fish and normally have a silvery hue to their exoskeletons. They are in your home because they are attracted to humid conditions, food, the hospitable environment or any combo of these. Although not known to transmit diseases to humans, silverfish can damage a home's contents and furnishings. They can enter a home through cracks or gaps around doors, walls or windows, or they may hitch a ride inside boxes or bags from infested locations. Once silverfish find a hospitable location, they tend to remain in place. If you have silverfish all over your house, they are likely seeking food, a better environment or more space for a growing population. Silverfish are willing to dine on a wide variety of foods, including other silverfish, so they can usually find something they like in any room in your house. Their favorite foods are starchy carbohydrates, such as paper, glue, flour and rolled oats. If your home is filled with excessive amounts of paper products, cardboard boxes or spilled cereal, they will be attracted to the buffet. They will also feed on proteins, such as dried meat, and when necessary, they may attack carpets and rugs, furs, starched clothing and leather products. Silverfish may feed on the paste securing your wallpaper, the books on your shelves, your magazine collection or your paper files. Silverfish have definite environmental preferences. They thrive best when temperatures are between 72 and 81 degrees Fahrenheit, which is the temperature range commonly found in American homes. Silverfish are primarily nocturnal, so they prefer to establish residency in an area that offers cracks or other niches where they can hide during daylight hours. 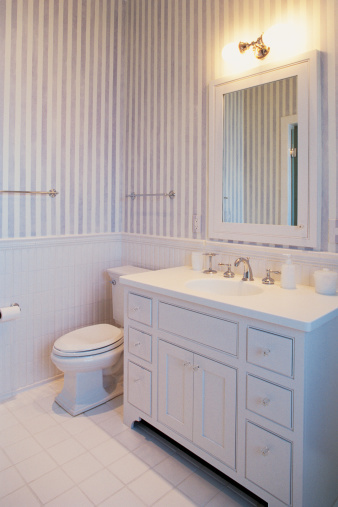 These pests also prefer humid conditions at least 75 percent relative humidity, making bathrooms an area that they commonly invade. However, any area that meets minimum requirements, such as areas around dishwashers, hot water heaters, sinks and furnaces, can also be the sites of silverfish colonies. Have you only seen silverfish in a few rooms? Good! Now check out the others. Even if you haven't seen one in a certain room, they are probably hiding out. Silverfish enjoy long lives that typically last between two and eight years. Each adult female can lay 100 or more eggs during her lifetime and each of her offspring can reach adulthood in as few as four weeks. Should the population become too numerous for the resources, some silverfish are likely to seek greener pastures and less-crowded conditions, such an another room in your house. A good cleaning can help prevent a solitary intruder from spawning an infestation, but once your home is infested with silverfish, eliminating them typically requires a combination of sanitary measures and chemical treatment. Sanitary measures include clearing out old newspapers, magazines and books, or placing them in plastic bins or boxes with airtight covers. Cardboard boxes can provide meals as well as shelter for silverfish, so removing them from your home is a good idea. Fix leaks around pipes, appliances or water heaters to eliminate moisture accumulation. Make sure that foods are stored in airtight, inaccessible containers. Use dehumidifiers or air conditioners to lower the overall humidity if an infestation is present in locations that house a concentrated food supply. Silverfish can be difficult to control with insecticides and the trick is to place it where the insects are most likely to contact them. Texas A&M University suggests treating the cracks and crevices where silverfish may be hiding, as well as the attic and empty spaces inside walls, with an insecticide labelled for silverfish or their cousins, firebrats. Products containing natural ingredients, such as boric acid, diotomaceous earth, thyme or clove oil, can be effective, as can manmade compounds such as permethrin, bifenthrin or deltamethrin. Some products contain only a single ingredient, but others can be a combination of ingredients. Regardless of the formulation selected, it is important to follow all safety precautions included on the product's label.